Advance booking is essential as the barn relies on voluntary wardens. Our building is a beautifully converted real barn. It relies only on natural heating and can be cool - but always with a warm welcome. There are three shared sleeping areas for a total of 11 people. We are closed daytime from 10 am to 5 pm (10:00 to 17:00). People from 5 to 17 years are welcome with a responsible adult. We give a £3 discount on arrival. We offer a 'green' voucher worth £3 when you arrive by foot, cycle or public transport. We have Wi-Fi, but mobile reception is unreliable. We have an excellent kitchen and there are two good local pubs for food. By making a booking you agree to our terms and conditions (pdf, 210 kB). Absolutely no motor vehicles beyond the road entrance, even for unloading luggage. Booking with this website gives you the best price - guaranteed. You should read our detailed information sheets (pdf, 300 kB) on the barn before you come to stay. And please read the rest of the page below - it has useful information. Advance booking is essential - just a reminder. From 13th April to the end of October 2019 we expect to open for many nights, including every weekend. Let us know in advance when you would like to stay, as we operate a flexible wardening scheme and often can open to fit in with what you are planning. We also know that if you are walking or cycling how important it can be to be completely sure of accommodation on a particular night. We give a 'green' voucher of £3 if arriving by foot, bicycle, horse or public transport, for use on a subsequent night. If you simply don't arrive and don't tell us - a 'no-show' - then we ask you to pay for the whole booking. If you bring fewer people than you booked space for, then we also ask for the full payment. If you have booked through another website where we have to pay them commission, we reserve the right to take that commission off any refund. We might be able to manage sole occupancy by arrangement. In these circumstances there would still be a warden in residence and the barn would be closed in the daytime between 10 am and 5 pm. The cost is £165 per night and the green voucher and young person discounts are applicable. For sole use by a family group there is no lower age limit. We have different cancellation conditions than for our normal bookings. Please ask. Membership of Project Oasis North Downs £6 (unwaged £4) - to support the Project and receive an occasional newsletter. The barn can sleep up to 11 visitors, and we welcome individuals, families or groups. The Barn is unsuitable for groups likely to be very noisy, as we have nearby neighbours in a very rural setting. 'Sole use' bookings are accepted on the understanding that there is a warden on the premises whenever the Barn is open. Our Eco Camping Barn exists to benefit people wishing to enjoy the countryside for recreational activities and we reserve the right to cancel group bookings considered unsuitable. If you are booking the Barn for a group, please ensure all participants see our information sheets (pdf, 300 kB) ahead of their visit. Then everyone can have an idea of what to expect. 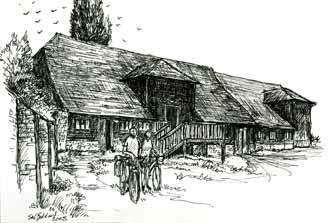 The barn provides a well equipped cooking and eating area, and platform beds in the sleeping area. You will need sleeping bags - bring your own or see 'Optional extras' above - and to bring your own food. There are good local pubs which usually serve meals, but there is no local food store in Puttenham. There is a limited number of items for sale at the barn. The nearest shop selling food is the Post Office at Shackleford, precisely two miles south (OS map grid reference SU 935 455). It is open on mornings only, seven days a week. There is no car or motor-cycle parking at the barn. We have Wi-Fi but mobile phone reception is unreliable because of the beautiful landscape. We don't even have a television. The local pubs may have Wi-Fi, but that's not guaranteed. Mobiles may work better after a short walk along the road. The user may feel better too. We cannot accommodate pets, but make an exception for guide dogs and other assistance dogs. Our organisation tries to accommodate all those seeking a greater knowledge, love and care of the countryside, regardless of their ability. Along with many organisations, we have a formal access statement (pdf, 74k) to show how we comply with typical visitor needs and requirements. Please understand the challenge that our old building gives in meeting these ideals.